When Luci joins the class, it quickly becomes apparent that he is no child like the others. The little horn peaks on his head and his hoof leave little room for doubt: Luci is a young devil straight from hell. Devils, even little ones, can do things others are incapable of. The class is mesmerised when Luci lights the teacher’s cigarette without matches, with no more than a flick of his long-clawed fingers! But how did he end up here, where he is constantly plagued by home sickness? Luci has come for his apprenticeship. He is to instigate 1,000 follies and for each and every one he carves a groove into his hoof. Once he’s accomplished his task, he can return to hell. The children are ecstatic and cause all kinds of mischief. But by the time more than 900 grooves have been gathered, many things have changed. The children want Luci to stay and do what they can in order to avoid new grooves from being carved. And even Luci, who adores the teacher, avoids some follies. Only the home sickness tempts him to play one or two pranks. And so the thousandth groove slowly comes closer. 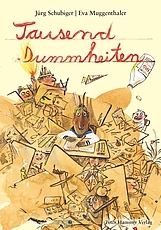 A story that only Jürg Schubiger could narrate in this manner: so fine, so warm, so humorously and with a deeper meaning. Eva Muggenthaler’s fantastic images have carried it even further!